Including inspirational quotes from famous people in any presentation, can cause it to have more impact on the audience. Ask those who have at some point shed tears after listening to a lecture, watch movies or even read a book. They were either moved by a few lines or a captivating quote. And according to best custom writing professionals, early preparation will enable you to have that natural flow when delivering your speech. Check out inspirational quotes that can help you motivate an audience and make your presentation impactful. This inspirational quote is from Winston Churchill, a one-time prime minister, and British politician who led Britain to victory in World War II. Churchill was a pragmatic leader who had great leadership abilities. However, the above quote can motivate someone who has been experiencing a series of failure in life. It will help to remind your audience that no challenge is permanent. It is just a phase everyone must pass through. And if they held their heads up high as Churchill did, they will surely conquer in no time. Every individual has a dream, but many don’t believe in theirs. However, adding such quotes in your speech will help your listeners to have a rethink about their goal and give it wings to fly. Eleanor Roosevelt is a figure that doesn’t need much introduction. Her dedication, hard work, and love for humanity will forever remain in the hearts of Americans and the world at large. Showing courage in the face of fear is a quote that can help students to conquer in life’s battles. This Eddie Rickenbacker’s quote indicates courage is not the absence of fear. But that one should show courage even in a difficult situation. The storm comes to test how rooted the trees are. And only those who are not profoundly grounded will be swept away by it. Show courage even when the odds are not in your favor. If you persist and remain consistent, you might end up with a great result. David Zucker is a force to be reckoned with as far as the movie industry is concerned. David is also a famous writer and producer. But the quote above suggests he didn’t get to where he is by sitting idle doing nothing. David was courageous and stayed focus on what he loved doing best. The quote above also indicates that perseverance pays. If you remain strong, even in the face of adversity, you are likely going to make it. Call Elon Musk as a superhero, and you are right about it. Of course, no ordinary person can do what he does. Elon runs about nine different companies successfully. He chose not to be an average man. And you too can only if you make up your mind. “We must accept finite disappointment but never lost finite hope.” ~ Martin Luther King. Hope is one thing that keeps every human alive. You are not sure about your tomorrow, but you have hope that you will live to see tomorrow. That’s hope even if you don’t think it is. So, no matter the number of disappointment and trials you face, never lose faith. This quote from Desmond Tutu urges students and everyone to speak up for the oppressed. If you remain silent, then it is a sign you have chosen to support the oppressor. Situations like these happen now and then in society. So people should learn to speak up. Don’t be afraid to defend yourself or others. No matter what you go through in life or view yourself as; there are still people who believe in your abilities. So even if you feel like throwing in the tower, don’t. The people who had faith in you took greater risk and courage to make such decision. Do not make them regret it. Thinking of the past will rob your today of precious hours. So why not focus on the present and avoid a similar mistake you made in the past? Time waits for no one. This quote from the famous Walt Disney will inspire your audience to take action in any situation instead of complaining. Complain does not solve problems. Instead, it makes it more complicated. This quote is similar to the one from Walt Disney. If you bothered too much about your failures yesterday, today’s success would be difficult to achieve. Add this quote to your speech to inspire your audience. “If you are working on something that you care about, you don’t have to be pushed. The vision pulls you.” ~ Steve Jobs. You can’t force a hungry person to eat when the food is in front of him or her. The same goes for any project you are working on at the moment. Thinking of how massive the result will turn out can inspire you to work harder. According to Steve Jobs’ quote; you don’t need to be pushed by anyone when you are doing something that will produce great results. Failures will come no matter how careful you are in your dealings. But you need to have a strong will to succeed to enable you to override failure and make your success evident. Life’s battles are not worn by the weak. And the number of times you fall does not matter. What matters is having the courage to stand up. Including this quote in your speech will inspire your audience to start seeing defeats as nothing but a test to move to another level. “The only limit to our realization of tomorrow will be our doubts of today.” ~ Franklin D. Roosevelt. Nurturing self-limiting beliefs can prevent one from reaching greater heights in life. So always think positive no matter the situation you find yourself. Using this famous quote will help to remind your audience of the need to think highly of themselves. “Reading is to the mind, as exercise is to the body.” ~ Brian Tracy. Not all students enjoy reading. But then, if you want to be successful academically, you have no other option than to read. However, take reading as a form of exercise, and you will hardly get tired of it. 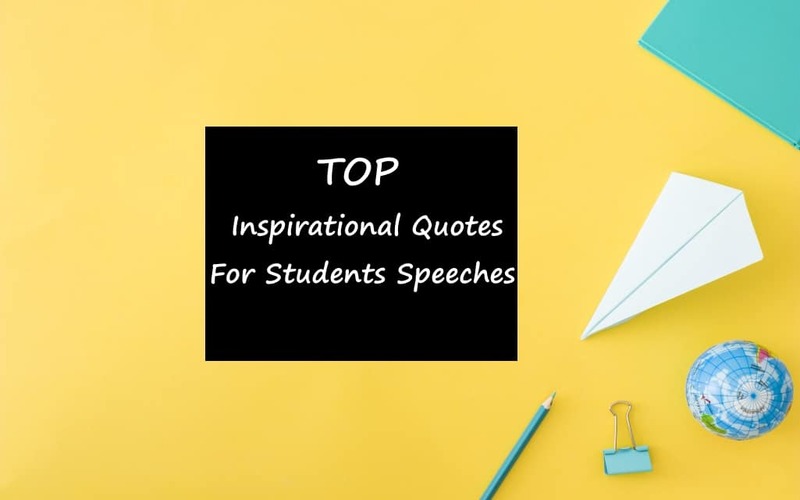 These are inspirational quotes that can inspire and bring out the best in any student. Most of them are quite popular and old, but yet have as great an impact as many years ago. And according to writingjobz.com, including inspiration quotes from famous people in speeches would leave a lasting impressing and inspire others to greatness.